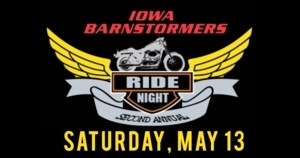 DES MOINES – The Iowa Barnstormers are gearing up for their Second Annual Motorcycle Ride and Tailgate event this Saturday, May 13. The Iowa Barnstormers have partnered with American Legion Riders Post 232 for their Annual Motorcycle Ride and Tailgate. Tickets for the ride are available now for $25 and will include entry to the ride, tailgate, and Barnstormers game. The ride will begin in Polk City with stops in Ames and Elkhart before arriving at Wells Fargo Arena in Des Moines. The tailgate event will begin at 4:00 p.m. as riders pull into Wells Fargo Arena. The tailgate will include live music from Alice Unchained, food trucks, and drink specials. Attendees will be able to enjoy tenderloins and burgers from SFC Yellow Truck, Mexican food options from Roadside Tacos, and dessert from Outside Scoop. Bottled soda and water will be available for $3, while 24 oz. beers will be available for $5. The tailgate will remain open until the start of the game at 7:00 p.m. Fans can then make their way inside Wells Fargo Arena to cheer on the Barnstormers as they face in-state rivals the Cedar Rapids Titans. A portion of the proceeds from the Motorcycle Ride will go back to American Legion Riders Post 232 to support their mission of helping Veterans in Central Iowa and beyond. Tickets to the Annual Motorcycle Ride are available now and can be purchased by contacting the Iowa Barnstormers front office at 515-633-2255 or visiting http://barnstormers.isportstix.com/order/group/RIDE17.